This timeless traditional chest from Home Styles blends well into any style of decor. Designed in a beautiful cherry colour, its exterior is constructed of sturdy manufactured wood material. Mid-Century modern never looked better. With its rich deep oak tone, clean lines, and smooth finish, the Hamilton wide dresser features four extending drawers prime for stashing your favorite jeans, tops, and other essentials, in style. Splayed wood legs keep this piece decorative and durable. Crafted to perfection, dress this piece up with framed photographs, favorite books, small television, and other personal items. Instantly transforming spaces, in the bedroom or living area, this dresser is a mainstay in any space. The Joy Tall Dresser is simple, beautifully crafted and chic, featuring six drawers, perfect for storing your favorite clothing and personal items. Streamlined design yet equally durable in quality, the dresser is engineered of high quality materials, and is a mainstay of any space it resides in. The top of the dresser includes a pair of drawers in a bold color of your choice, followed by four other rectangular extension drawers creating ample storage without compromising on its minimalist lines. Sleek round knobs and warm oak, gives off a timeless quality. Chesapeake 36-inch x 36.75-inch x 16.5-inch 4-Drawer Chest in Cherry This timeless traditional chest from Home Styles blends well into any style of decor. Designed in a beautiful cherry colour, its exterior is constructed of sturdy manufactured wood material. 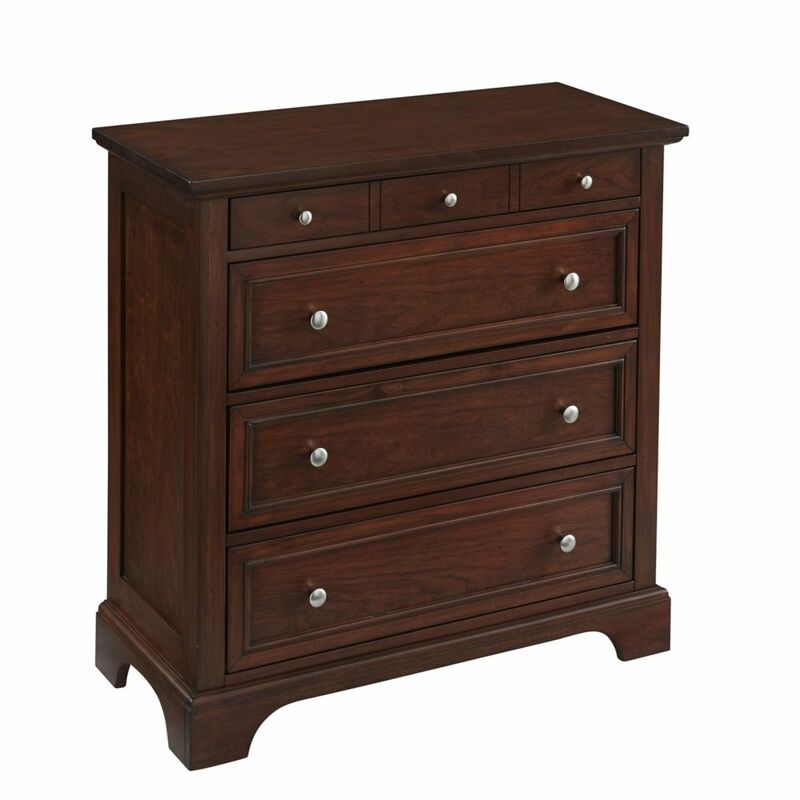 Chesapeake 36-inch x 36.75-inch x 16.5-inch 4-Drawer Chest in Cherry is rated 4.7 out of 5 by 3. Rated 4 out of 5 by Amber from The dresser was easy to assemble. By myself it took a little over an hour. It is beautiful. I was... The dresser was easy to assemble. By myself it took a little over an hour. It is beautiful. I was a little disappointed in the depth of the top drawer. It is barely 2 inches deep, whereas the face of it makes it appear deeper. Perfect for jewelry, but with an infant, I was hoping for something with a little more space for her clothing/necessities. Rated 5 out of 5 by Delighted from The chest is very well built and went together easily.... The chest is very well built and went together easily. It was an excellent product at a reasonable price. Rated 5 out of 5 by Q7Y3 from The chests required a couple of hours to assemble,however the... The chests required a couple of hours to assemble,however the finish product was worth the time.I am very pleased with this purchase.